Coal-burning factories in 19th-century Manchester, England. Improved technology allowed coal to fuel the Industrial Revolution, greatly increasing the consumption of coal. 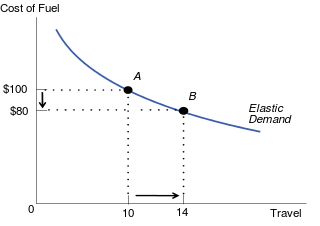 In economics, the Jevons paradox (/ˈdʒɛvənz/; sometimes Jevons effect) occurs when technological progress or government policy increases the efficiency with which a resource is used (reducing the amount necessary for any one use), but the rate of consumption of that resource rises due to increasing demand. The Jevons paradox is perhaps the most widely known paradox in environmental economics. However, governments and environmentalists generally assume that efficiency gains will lower resource consumption, ignoring the possibility of the paradox arising. The issue has been re-examined by modern economists studying consumption rebound effects from improved energy efficiency. In addition to reducing the amount needed for a given use, improved efficiency also lowers the relative cost of using a resource, which increases the quantity demanded. This counteracts (to some extent) the reduction in use from improved efficiency. Additionally, improved efficiency increases real incomes and accelerates economic growth, further increasing the demand for resources. The Jevons paradox occurs when the effect from increased demand predominates, and improved efficiency increases the speed at which resources are used. Considerable debate exists about the size of the rebound in energy efficiency and the relevance of the Jevons paradox to energy conservation. Some dismiss the paradox, while others worry that it may be self-defeating to pursue sustainability by increasing energy efficiency. Some environmental economists have proposed that efficiency gains be coupled with conservation policies that keep the cost of use the same (or higher) to avoid the Jevons paradox. Conservation policies that increase cost of use (such as cap and trade or green taxes) can be used to control the rebound effect. The Jevons paradox was first described by the English economist William Stanley Jevons in his 1865 book The Coal Question. Jevons observed that England's consumption of coal soared after James Watt introduced the Watt steam engine, which greatly improved the efficiency of the coal-fired steam engine from Thomas Newcomen's earlier design. Watt's innovations made coal a more cost-effective power source, leading to the increased use of the steam engine in a wide range of industries. This in turn increased total coal consumption, even as the amount of coal required for any particular application fell. Jevons argued that improvements in fuel efficiency tend to increase (rather than decrease) fuel use, writing: "It is a confusion of ideas to suppose that the economical use of fuel is equivalent to diminished consumption. The very contrary is the truth." At that time, many in Britain worried that coal reserves were rapidly dwindling, but some experts opined that improving technology would reduce coal consumption. Jevons argued that this view was incorrect, as further increases in efficiency would tend to increase the use of coal. Hence, improving technology would tend to increase the rate at which England's coal deposits were being depleted, and could not be relied upon to solve the problem. Although Jevons originally focused on the issue of coal, the concept has since been extended to the use of any resource, including, for example, water usage and interpersonal contact. It is perhaps the most widely known paradox in environmental economics. Elastic Demand: A 20% increase in efficiency causes a 40% increase in travel. Fuel consumption increases and the Jevons paradox occurs. Inelastic Demand: A 20% increase in efficiency causes a 10% increase in travel. The Jevons paradox does not occur. Economists have observed that consumers tend to travel more when their cars are more fuel efficient, causing a 'rebound' in the demand for fuel. An increase in the efficiency with which a resource (e.g. fuel) is used, causes a decrease in the cost of using that resource when measured in terms of what it can achieve (e.g. travel). Generally speaking, a decrease in the cost (or price) of a good or service will increase the quantity demanded (the law of demand). With a lower cost for travel, consumers will travel more, increasing the demand for fuel. This increase in demand is known as the rebound effect, and it may or may not be large enough to offset the original drop in fuel use from the increased efficiency. The Jevons paradox occurs when the rebound effect is greater than 100%, exceeding the original efficiency gains. The size of the direct rebound effect is dependent on the price elasticity of demand for the good. In a perfectly competitive market where fuel is the sole input used, if the price of fuel remains constant but efficiency is doubled, the effective price of travel would be halved (twice as much travel can be purchased). If in response, the amount of travel purchased more than doubles (i.e. demand is price elastic), then fuel consumption would increase, and the Jevons paradox would occur. If demand is price inelastic, the amount of travel purchased would less than double, and fuel consumption would decrease. However, goods and services generally use more than one type of input (e.g. fuel, labour, machinery), and other factors besides input cost may also affect price. These factors tend to reduce the rebound effect, making the Jevons paradox less likely to occur. In the 1980s, economists Daniel Khazzoom and Leonard Brookes revisited the Jevons paradox for the case of society's energy use. Brookes, then chief economist at the UK Atomic Energy Authority, argued that attempts to reduce energy consumption by increasing energy efficiency would simply raise demand for energy in the economy as a whole. Khazzoom focused on the narrower point that the potential for rebound was ignored in mandatory performance standards for domestic appliances being set by the California Energy Commission. In 1992, the economist Harry Saunders dubbed the hypothesis that improvements in energy efficiency work to increase (rather than decrease) energy consumption the Khazzoom–Brookes postulate, and argued that the hypothesis is broadly supported by neoclassical growth theory (the mainstream economic theory of capital accumulation, technological progress and long-run economic growth). Saunders showed that the Khazzoom–Brookes postulate occurs in the neoclassical growth model under a wide range of assumptions. According to Saunders, increased energy efficiency tends to increase energy consumption by two means. First, increased energy efficiency makes the use of energy relatively cheaper, thus encouraging increased use (the direct rebound effect). Second, increased energy efficiency increases real incomes and leads to increased economic growth, which pulls up energy use for the whole economy. At the microeconomic level (looking at an individual market), even with the rebound effect, improvements in energy efficiency usually result in reduced energy consumption. That is, the rebound effect is usually less than 100%. However, at the macroeconomic level, more efficient (and hence comparatively cheaper) energy leads to faster economic growth, which increases energy use throughout the economy. Saunders argued that, taking into account both microeconomic and macroeconomic effects, technological progress that improves energy efficiency will tend to increase overall energy use. Jevons warned that fuel efficiency gains tend to increase fuel use. However, this does not imply that improved fuel efficiency is worthless if the Jevons paradox occurs; higher fuel efficiency enables greater production and a higher material quality of life. For example, a more efficient steam engine allowed the cheaper transport of goods and people that contributed to the Industrial Revolution. Nonetheless, if the Khazzoom–Brookes postulate is correct, increased fuel efficiency, by itself, will not reduce the rate of depletion of fossil fuels. There is considerable debate about whether the Khazzoom-Brookes Postulate is correct, and of the relevance of the Jevons paradox to energy conservation policy. Most governments, environmentalists and NGOs pursue policies that improve efficiency, holding that these policies will lower resource consumption and reduce environmental problems. Others, including many environmental economists, doubt this 'efficiency strategy' towards sustainability, and worry that efficiency gains may in fact lead to higher production and consumption. They hold that for resource use to fall, efficiency gains should be coupled with other policies that limit resource use. However, other environmental economists point out that, while the Jevons Paradox may occur in some situations, the empirical evidence for its widespread applicability is limited. The Jevons paradox is sometimes used to argue that energy conservation efforts are futile, for example, that more efficient use of oil will lead to increased demand, and will not slow the arrival or the effects of peak oil. This argument is usually presented as a reason not to enact environmental policies or pursue fuel efficiency (e.g. if cars are more efficient, it will simply lead to more driving). Several points have been raised against this argument. First, in the context of a mature market such as for oil in developed countries, the direct rebound effect is usually small, and so increased fuel efficiency usually reduces resource use, other conditions remaining constant. Second, even if increased efficiency does not reduce the total amount of fuel used, there remain other benefits associated with improved efficiency. For example, increased fuel efficiency may mitigate the price increases, shortages and disruptions in the global economy associated with peak oil. Third, environmental economists have pointed out that fuel use will unambiguously decrease if increased efficiency is coupled with an intervention (e.g. a fuel tax) that keeps the cost of fuel use the same or higher. The Jevons paradox indicates that increased efficiency by itself may not reduce fuel use, and that sustainable energy policy must rely on other types of government interventions as well. As the imposition of conservation standards or other government interventions that increase cost of use do not display the Jevon paradox, they can be used to control the rebound effect. To ensure that efficiency-enhancing technological improvements reduce fuel use, efficiency gains can be paired with government intervention that reduces demand (e.g. green taxes, cap and trade, or higher emissions standards). The ecological economists Mathis Wackernagel and William Rees have suggested that any cost savings from efficiency gains be "taxed away or otherwise removed from further economic circulation. Preferably they should be captured for reinvestment in natural capital rehabilitation." By mitigating the economic effects of government interventions designed to promote ecologically sustainable activities, efficiency-improving technological progress may make the imposition of these interventions more palatable, and more likely to be implemented. ^ Bauer, Diana; Papp, Kathryn (March 18, 2009). "Book Review Perspectives: The Jevons Paradox and the Myth of Resource Efficiency Improvements". Sustainability: Science, Practice, & Policy. 5 (1). Archived from the original on 29 May 2015. Retrieved 29 May 2015. ^ a b York, Richard (2006). "Ecological paradoxes: William Stanley Jevons and the paperless office" (PDF). Human Ecology Review. 13 (2): 143–147. Retrieved 2015-05-05. ^ a b c Alcott, Blake (July 2005). "Jevons' paradox". Ecological Economics. 54 (1): 9–21. doi:10.1016/j.ecolecon.2005.03.020. ^ a b c Jevons, William Stanley (1866). "VII". The Coal Question (2nd ed.). London: Macmillan and Company. OCLC 464772008. Retrieved 2008-07-21. ^ a b c d e Alcott, Blake (2008). "Historical Overview of the Jevons paradox in the Literature". In JM Polimeni; K Mayumi; M Giampietro (eds.). The Jevons Paradox and the Myth of Resource Efficiency Improvements. Earthscan. pp. 7–78. ISBN 978-1-84407-462-4. ^ a b c Wackernagel, Mathis; Rees, William (1997). "Perceptual and structural barriers to investing in natural capital: Economics from an ecological footprint perspective". Ecological Economics. 20 (3): 3–24. doi:10.1016/S0921-8009(96)00077-8. ^ a b c Freire-González, Jaume; Puig-Ventosa, Ignasi (2015). "Energy Efficiency Policies and the Jevons Paradox". International Journal of Energy Economics and Policy. 5 (1): 69–79. Retrieved 29 May 2015. ^ Dumont, A.; Mayor, B.; López-Gunn, E. (2013). "Is the Rebound Effect or Jevons Paradox a Useful Concept for Better Management of Water Resources? Insights from the Irrigation Modernisation Process in Spain". Aquatic Procedia. 1: 64–76. doi:10.1016/j.aqpro.2013.07.006. ^ a b Small, Kenneth A.; Kurt Van Dender (2005-09-21). "The Effect of Improved Fuel Economy on Vehicle Miles Traveled: Estimating the Rebound Effect Using U.S. State Data, 1966–2001". Policy and Economics. Retrieved 2010-09-01. ^ Chan, Nathan W.; Gillingham, Kenneth (1 March 2015). "The Microeconomic Theory of the Rebound Effect and Its Welfare Implications". Journal of the Association of Environmental and Resource Economists. 2 (1): 133–159. doi:10.1086/680256. ISSN 2333-5955. ^ a b c d Saunders, Harry D. (October 1992). "The Khazzoom-Brookes Postulate and Neoclassical Growth". The Energy Journal. 13 (4): 131–148. JSTOR 41322471. ^ Herring, Horace (19 July 1999). "Does energy efficiency save energy? The debate and its consequences". Applied Energy. 63 (3): 209–226. doi:10.1016/S0306-2619(99)00030-6. ISSN 0306-2619. ^ a b Sorrell, Steve (April 2009). "Jevons' Paradox revisited: The evidence for backfire from improved energy efficiency". Energy Policy. 37 (4): 1456–1469. doi:10.1016/j.enpol.2008.12.003. ^ a b Greening, Lorna; David L. Greene; Carmen Difiglio (2000). "Energy efficiency and consumption—the rebound effect—a survey". Energy Policy. 28 (6–7): 389–401. doi:10.1016/S0301-4215(00)00021-5. ^ Ryan, Lisa; Campbell, Nina (2012). "Spreading the net: the multiple benefits of energy efficiency improvements". IEA Energy Papers. doi:10.1787/20792581. Retrieved 5 June 2015. ^ Owen, David (December 20, 2010). "Annals of Environmentalism: The Efficiency Dilemma". The New Yorker. pp. 78–. ^ Gillingham, Kenneth; Kotchen, Matthew J.; Rapson, David S.; Wagner, Gernot (23 January 2013). "Energy policy: The rebound effect is overplayed". Nature. 493 (7433): 475–476. doi:10.1038/493475a. ISSN 0028-0836. PMID 23344343. ^ Potter, Andrew (2007-02-13). "Planet-friendly design? Bah, humbug". Maclean's. 120 (5): 14. Archived from the original on 2007-12-14. Retrieved 2010-09-01. ^ Strassel, Kimberley A. (2001-05-17). "Conservation Wastes Energy". The Wall Street Journal. Archived from the original on 2005-11-13. Retrieved 2009-07-31. ^ Gottron, Frank (2001-07-30). "Energy Efficiency and the Rebound Effect: Does Increasing Efficiency Decrease Demand?" (PDF). National Council for Science and the Environment. Retrieved 2012-02-24. ^ Hirsch, R. L.; Bezdek, R.; and Wendling, R. (2006). "Peaking of World Oil Production and Its Mitigation". AIChE Journal. 52 (1): 2–8. doi:10.1002/aic.10747. ^ Amado, Nilton Bispo; Sauer, Ildo L. (February 2012). "An ecological economic interpretation of the Jevons effect". Ecological Complexity. 9: 2–9. doi:10.1016/j.ecocom.2011.10.003. ^ Laitner, John A.; De Canio, Stephen J.; Peters, Irene (2003). Incorporating Behavioural, Social, and Organizational Phenomena in the Assessment of Climate Change Mitigation Options. Society, Behaviour, and Climate Change Mitigation. Advances in Global Change Research. 8. pp. 1–64. doi:10.1007/0-306-48160-X_1. ISBN 978-0-7923-6802-1. Jenkins, Jesse; Nordhaus, Ted; Shellenberger, Michael (February 17, 2011). Energy Emergence: Rebound and Backfire as Emergent Phenomena (Report). Oakland, CA: The Breakthrough Institute. Retrieved 29 May 2015. Lords Select Committee on Science and Technology (5 July 2005). "3: The economics of energy efficiency". Select Committee on Science and Technology Second Report (Report). Session 2005–06. London, UK: House of Lords. Michaels, Robert J. (July 6, 2012). Energy Efficiency and Climate Policy: The Rebound Dilemma (PDF) (Report). Washington, D.C.: Institute for Energy Research. Retrieved 5 June 2015.